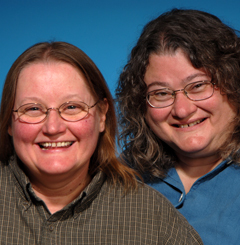 Durkin (left) and Walowitz are partners, and were married in Canada soon after it became legal to do so. They are cultural activists. Durkin works on women's shelter issues, and Walowitz is a therapist. Walowitz is also a performer, singing out lesbian music since the 1970s.